Maybe you noticed Vancouver 2010, the official title for the Winter Olympics, released last week. But more than VIII Olympiads since the Activision Decathlon and the Epyx Summer Games, the Olympics still have no real toehold in the sports genre. There are any number of reasons why, but the fact remains: It is the biggest sports property least served by traditional sports game adaptations. For an enterprise commanding billions in television rights fees, with a global viewership second only to international football, its video games are practically nonentities. 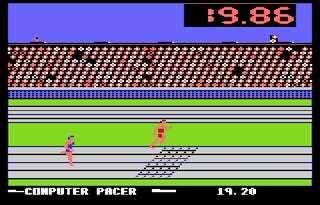 Worse, Olympic games have really yet to seriously compete with their 8-bit forebears, like Konami's Track and Field, for widespread appeal. Fantasy-based games like Mario & Sonic at the Olympic Winter Games seem to do much better instead. The problems faced by Olympics simulations are many, and not all of them as obvious as you might think. • First and foremost: There's four years between titles, but it doesn't deliver the benefit ofa four-year development cycle. So the delay between versions amounts to a once-per console generation offering so far. That makes every version into a first-adopter decision. Yes, the Winter and Summer Games are staggered by two years but you are still dealing with wildly divergent offerings. • There's no unifying thread of gameplay among all the events, which essentially makes an Olympics game a series of minigames. Then, the objectives at hand are then either extremely basic - run as fast as you can in one direction - or inscrutably complex, such as a gymnastics floor routine. Notably, figure skating is not a part of Vancouver 2010, likely because building a stand-alone title on this type of sport would be challenging enough. Reducing it to one component in a larger title would probably require gameplay simplified to the point of trivializing the event. • With the exception of events like boxing, ice hockey and basketball - none of which are included in the Beijing or Vancouver game - these sports just are not compelling enough in the American television market for more than two out of every 208 weeks on the calendar. Like it or not, sports games take their cues from this market. Mixed martial arts' rise as a television phenomenon means we'll see three titles in the span of 18 months, after all. But even Olympic showpieces like figure skating, women's gymnastics, swimming and downhill skiing barely register a blip outside of an Olympic year, much less outside the Olympics themselves. • Then, the most interesting events to younger players are already poached by separate titles. We see this especially with the Winter Olympics, which have added more extreme-sports inspired events to grow its appeal and television audience. Well, Shaun White already has a snowboarding title, and entertaining performance events like the half-pipe aren't even in Vancouver 2010. • There's no meaningful career mode. In real life, the Olympics are not just a two-week burst of adrenaline, they're the culmination of four years of training and qualifying. For some athletes, the drive to make their nation's Olympic team is a motivation absolutely unique among sports - especially if they narrowly missed qualifying in an earlier Olympics, or are near the end of their careers. This kind of career progression has no analogue in Olympics video games and, unfortunately, it's essential to caring about one's performance in the Games themselves, even if virtually. • Finally, there's a lack of recognizable, or even playable superstars. Half the fantasy of modern sports games is either competing as that sport's leading talent, or with him or her as a created player. Recent Olympics games are more about competing for one's country rather than inhabiting the persona of its top performers, by now a basic component of a sports simulation. So what to do? Considering how a multisport competition is so necessarily gameplay driven, an Olympics video game might be better served as an arcade-size PlayStation Network or Xbox Live release. Of course, it depends on how much a retail copy will still sell among a sports gaming public not as discriminating in its purchases - because rights holders have most likely paid a sum that can't be recouped without a retail release, no matter how poorly received. But ideally, a digital download of a few popular events - or several packages of events that gamers may pick and choose - might deliver a better value. At any rate, you'd be hard pressed to find anyone recommending the Olympics as a $60 video game purchase. It seems that by releasing every four years, Olympics video games have evolved at a quarter the rate of their other sports peers, especially in the era of three-dimensional gameplay. The Olympic motto may be Swifter, Higher, Stronger. But some lowered expectations might serve both gamer and publisher here.